Excellent light tackle spanish mackeral, bullet bonito and a few false albacore. First tarpon of the year! He says that this was the best sign of fish he's seen in a decade......huge tarpon by Garret! Yes, those aggrivating rascals have made an appearance in the Neuse. A fish that I really love to hate. Anyone want to try? 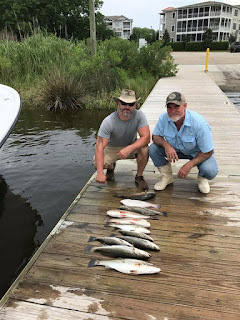 Good mixed bag bite also with a lot of little pups, also a wave of 30 inchers, plenty of trout from one to two feet long and a good sign of little flounders. Congrats to Marty and Brian, formerly of the Run Off. Not sure what they will be doing after winning the Big Rock Blue Marlin tournament, but they will no longer be on the Run Off. 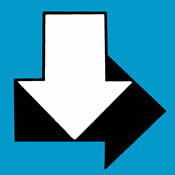 Will keep you posted on their new ventures and adventures. Hope to start seeing more of these, sign of a good spawn last August/September. By this October they will be around 18 inches and big enough to give a tug. 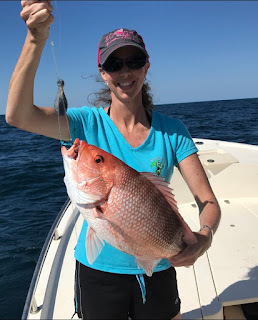 First Big Drum on a Cork of the Year? Don't know if this was the first one. Don't know if it was alone. I do know that yes, Capt. Greg can get 'em on a cork. Photo from the Neuse, just minutes ago. 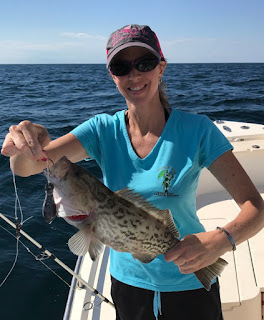 Poked out to my sandbox for a few drops and got some pulledge, but did not run into the aj's, bass and bigger groupers that are normally lurking around those parts. Saw no cobia. 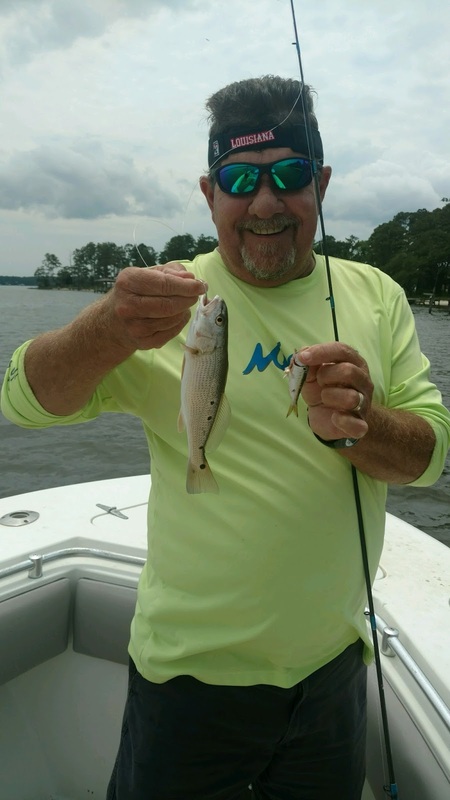 Meanwhile some good trips coming out of the lower Neuse. Congrats to Capt. 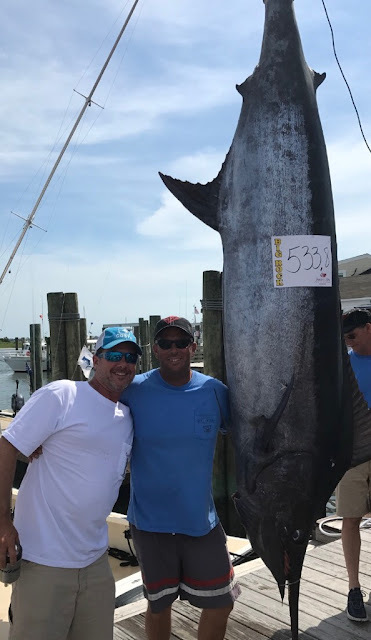 Brian Harrington and Marty on the Run Off for this 533 pounder, worth a minimum of $460K for being the first fish over 500 pounds weighed in the 2017 Big Rock Blue Marlin Tournament. They are poised to win well over $1million if this fish holds up as the first place fish with 5 more days of fishing to go. What many don't realize, is now that the pressure is off, Capt. Brian and Marty are very motivated to go catch another one bigger than this one! I have always said that Capt. Brian is the hardest working waterman that I know and this is well deserved. Congratulations to Marty and Brian and crew of the Run Off! I had the pleasure to get invited along on an offshore trip on The General yesterday in search of billfish. We had another group on The Bill Collector in hopes of loading the boat with dolphin, which is normally a pretty consistent fishery this time of year. Although we did have a blue marlin take a look at one of our teasers and I got some really good sushi off of an oceanic bonito, we never saw another fish or got another bite anywhere in our travels except from the one loan wooden pallet that was "covered up" with dolphin. We landed 16 bailers and gaffers, including my citation 45 pounder before turning it over to a nearby boat and continuing on our fruitless search for billfish. Meanwhile, the guys on the Bill Collector hooked up to a blue marlin and landed a sailfish, EXACTLY what we were looking for, but they only had a handful of shots at dolphin. Anytime you catch a billfish and hook a blue marlin off the NC coast that's a great day, so both boats had great days, just with the wrong customers. If it were only like a restaurant and you could order up what you want.